They are durable, so they will stand up to Calgary’s harsh climate. 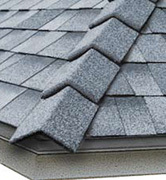 They are highly economical compared to other roofing options, which means they are budget friendly. They look great, which can improve the value of your home and enhance curb appeal. They come in many colour options, so you’re sure to find something to suit your taste. At Bricor Roofing, we pride ourselves on providing quality products to meet our customers’ needs. 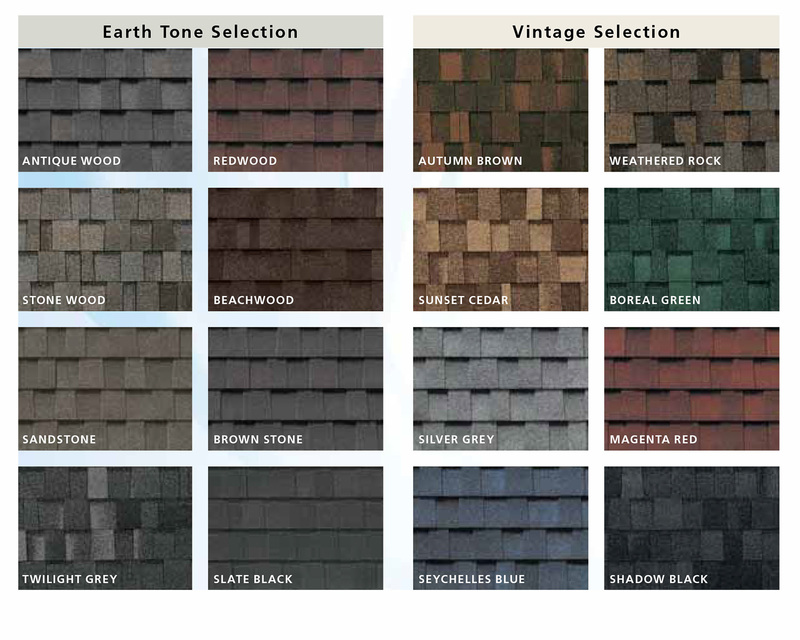 If you are looking for something other than asphalt shingles, we can custom order products for you. Please contact us today and we will be happy to discuss other roofing options. We primarily work with the following products as we find them to be of the best value and quality. If you are looking for a product not listed below, please contact us to discuss ordering options. 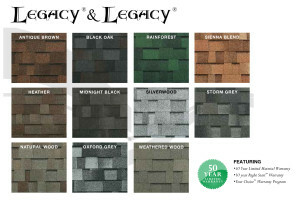 BP Mystique shingles are an affordable double-layer laminate shingle. Its bold look will please for years thanks to uncompromising durability. Outstanding choice of sixteen earth tone and vintage colors to harmonize with the exterior cladding of any home. Colour options: See the Colour Options image to the right, or check out our BP Mystique Photo Gallery to see the shingles installed. CRC/IKO Biltmore shingles are the shingle of choice for homeowners who demand the best in terms of quality, durability and value. Combining an extraordinary shake-like design with superior protection makes it a time-tested favourite. Colour options: See the Colour Options image to the right, or check out our CRC/IKO Biltmore Photo Gallery to see the shingles installed. 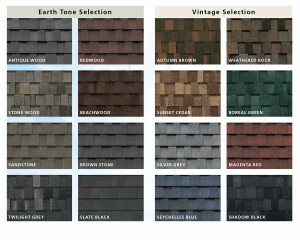 BP Manoir shingles are an asphalt, architectural style shingle with a black background. Manoir’s random tab design with deep shadow lines creates a distinctly dimensional, sculpted slate look. The exposed portion of this full-sized fiberglass laminate shingle offers more coverage than any standard shingle. 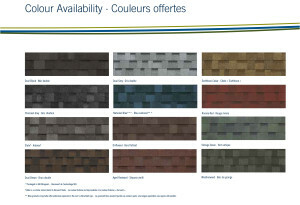 Manoir’s superior protection is further backed by BP’s innovative Weather-Tite™ technology to ensure these shingles grip tightly in the roughest weather. Choose from seven warm, rustic colors to complement your manor’s distinctive character. 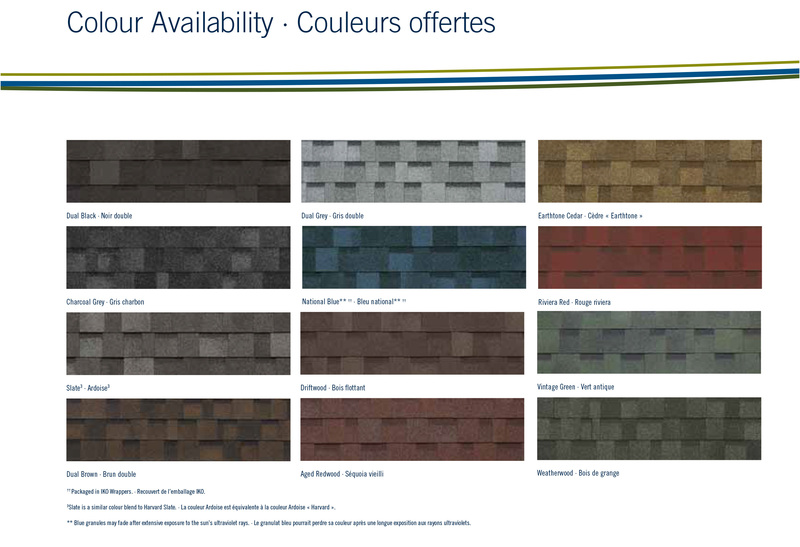 Colour Options: See the Colour Options image to the right, or check out our BP Manoir Photo Gallery to see the shingles installed. Malarkey’s revolutionary Legacy shingle technology begins with a durable base layer of fiberglass mat. Malarkey’s unique fiberglass mat is coated on both sides with the SBS modified rubber asphalt which provides tensile strength and increased flexibility. The thermo cycling resilience of SBS modified asphalt provides greater granule adhesion for the shingle to create a better barrier from the elements. When granules stay on the shingles, your roof lasts longer. 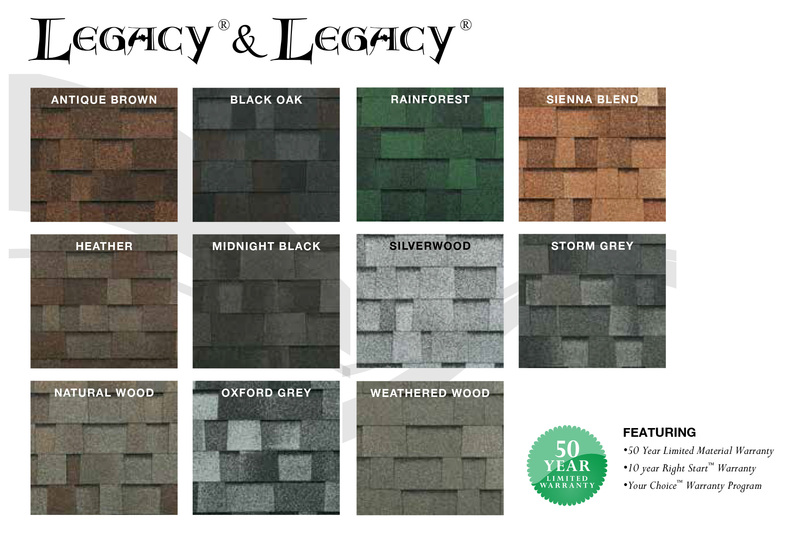 Malarkey Legacy asphalt shingles provide a durable barrier against extreme weather, receiving the highest Impact Resistance classification possible. In a rating test, the Legacy shingles withstood a simulation of hailstones impacting a roof at 90 mph (144 kph) without sustaining damage. Colour Options: See the Colour Options image to the right, or check out our Malarkey Legacy Photo Gallery to see the shingles installed. Bricor Roofing always wants to give you the best roof possible. The following options and upgrades can improve your roof by providing enhanced looks and ventilation. Skillfully designed, the static Maximum ventilator has no moving parts, and needs no electrical energy. 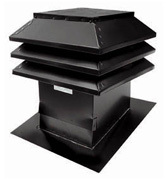 Its characteristics increase the ventilation’s chimney effect and eliminate excess humidity. The Maximum ventilator silently and efficiently assures the comfort of a home and its occupants. Its square shape enables it to pick up wind from all directions yet keeps out rain and snow due to its storm proof deflectors, and allows humidity to escape evenly and systematically. When you’ve just built a roof with IKO premium shingles, there’s only one way you can top its long-lasting good looks – with IKO UltraHP™ High Profile Ridge Cap Shingles! Our new, specially constructed ridge cap shingles are designed to provide a high-quality alternative to using cut-up shingles to protect this important area. The HP stands for High Profile, which means that they’re also designed to enhance the architectural shake-like appearance and dimensional profile of our premium architectural fiberglass shingles.